Kimmy hadn't always been that big. 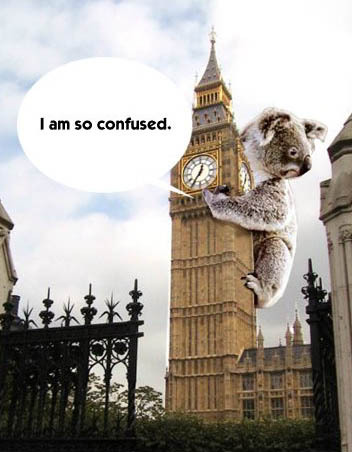 But then he hadn't always been a koala either. He was born a normal boy. Some people are born koalas and some people have giant koala-dom thrust upon them. He was the latter. Kim developed the urge to cling to things. Mainly large buildings. Small buildings simply crumbled under his enormous weight. It wasn't much of a life. Here is a giant squirrel. 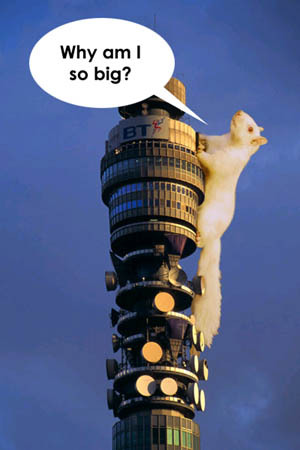 It is climbing the BT tower. Canny readers may have noticed that one of the themes of this website is transformation. Another theme is furry animals. It's easier to explain the furry animals - they are cute and harmless and people like them. As for the notion of transformation - I think it is a hangover from adolescence. Our bodies metamorphosise as we approach adolescence, but our minds are left in childhood and struggle to adapt to the challenges of this new, adult world. And therein lies the alienation that many young adults feel - the idea that they are imposters, children stranded on the shores of adulthood, trying to bluff their way through. But they rarely change into giant animals.